If This Then That (IfTTT) can be used to accomplish all sorts of cool things and, while not limited to any particular area, it has been seeing some growth in the area of home automation as several products have enabled its usage and D-Link is doing the same. The company is announcing that its line of mydlink is getting IfTTT integration. This will work across a broad range of devices including smart plugs, water and motion sensors, WiFi alarms and the new smart alarm detector. “Users want to integrate and expand their home automation system with other devices and services. With the integration of IFTTT into the mydlink Home ecosystem, users can enhance and expand control of their home using IFTTT recipes to trigger a variety of actions — almost like a programmer — creating an automated home designed to fit their needs,” says Ken Loyd, Director of Product Marketing at D-Link. “Integrating with IFTTT opens up a world of possibilities and provides users with unprecedented control over their mydlink Home experience”. If you have used IfTTT then you know that the things you set up are “recipes”. You can choose from an ever-expanding list of ones created by other users or, if you’re ambitious, you can create your own. D-Link has provided some information on this which you can find below. mydlink Wi-Fi Smart Plug: Whether scheduling a fan to turn off when you leave for work, turning on a stereo every morning to get pumped for the day, or setting a schedule for the night light to turn off in the kids’ room, with the mydlink Home app and IFTTT, the D-Link Wi-Fi Smart Plugs make homes brighter, safer and more in tune with you. mydlink Wi-Fi Water Sensor: The Wi-Fi Water Sensor lets users know when leaks are detected before it’s too late. Get alerted before a problem becomes a disaster with a mobile alert and audible alarm. With an IFTTT recipe, flicker the lights in the living room if a water heater leak is detected in the garage, turn the lamp on in the bathroom if a sink or bathtub is overflowing, or sound a Wi-Fi Siren. mydlink Wi-Fi Siren: D-Link’s Wi-Fi Siren can scare away potential intruders and automate a home for awareness, deterrence and security. Pair with a Wi-Fi Motion or Water Sensor to get alerted when movement or water is detected in a range of personalized ways. With an IFTTT recipe you can sound the siren if the temperature falls below freezing, so you can protect water pipes before it’s too late, or sound the siren if motion is detected after a specified time. mydlink Wi-Fi Motion Sensor: Whether it’s turning on the lights in the bedroom for a bright welcome home, a siren sounding if the front door is opened in the middle of the night, or an alert to clean up the litter box, IFTTT support helps make a home react to motion. D-Link’s Wi-Fi Motion Sensor sends push notifications to a smartphone or tablet when motion is detected, so users always know what’s happening while away. Availability of IfTTT support will come late in quarter one of 2016. In my first post on Philips Hue, I referred to “The Internet of things” where normally dumb devices such as fridges and washing machines are connected to the network. Having a washing machine with an IP address may mean that I can check whether the spin cycle has finished without getting out of my chair, but the real value of the internet of things comes when the devices start communicating among themselves. Not in a nefarious SkyNet way, but in a more practical sense: the washing machine counts the number of washes and when the soap is getting low, automatically orders your preferred brand from your preferred grocery service. Obviously, it’s going to take a little while until this is a reality, but the web site IFTTT is beginning to show what is possible as more and more services are on-line and cloud-based. IFTTT is an abbreviation of “If This, Then That” and reflects what IFTTT can do. It automates “If something happens, then I want that to happen”. In IFTTT-speak, a trigger on a channel generates an action on another (or the same) channel. A channel is typically an on-line or cloud-based service such as Twitter, Dropbox, Gmail, Evernote or Weather. An example of what could happen is, “If I get a tweet on Twitter, copy it to Evernote” or “Every morning at 7.00 am, text me the weather forecast”. These are recipes, as IFTTT calls them, and there’s a large range of them already cooked up on the IFTTT web site. It’s at this point in the story that Philips Hue comes in as a channel on IFTTT, which means that the lights in your home can be controlled by external events via the recipes on IFTTT. Here are some examples of recipes already available; at sunset, turn on the lights; when it’s freezing outside, turn the lights blue; when you receive an email from a particular person, blink the links; when the stockmarket closes down, turn the lights red. Some recipes are perhaps more useful than others, but the range of channels means that there’s tremendous flexibility. There are currently 77 channels on IFTTT and you can browse by channel, so it’s easy to see all the recipes that involve Philips Hue. Setting up your Hue to work with IFTTT is two step process but it only has to be done once. The first step is to register with the Philips Hue website and allow the site to access the bridge unit within your home. Once you’ve done this and have a username and password, you can control your lights from outside your home using the Hue app on your smartphone too, so it’s probably something that most Hue owners have already done. 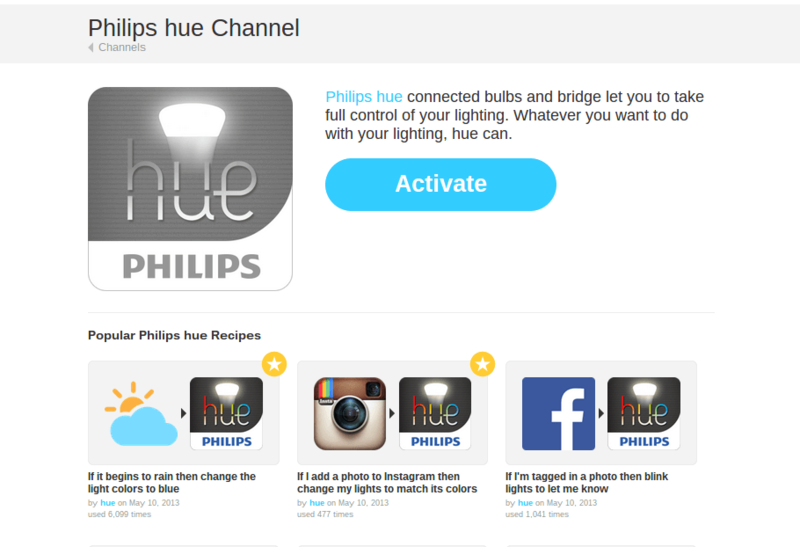 Back at IFTTT, the second step is then to activate your Hue channel. 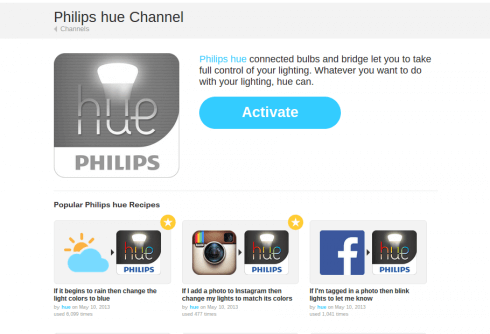 You’ll need to supply your Hue username and password, and authorise IFTTT to access your account. Now I’m going reuse a recipe that someone else has already created. In this instance, I’m going to flash the lights when I receive an email with the latest GNC podcast. I’ve already activated my Gmail channel. All I have to do is put in the email address – geeknews at gmail.com – and any time I get an email from Todd, the lights flash. This is the basic recipe; there are others that use keywords or other information likely to be in an email. If I want to, I can choose one particular light or all of them. Once the information is typed in and the recipe has been activated, all I have to do is sit back and wait for the latest podcast email to come in. Blink, blink. That’s it. All pretty straightforward. If you are more adventurous, you can delve deeper into the recipes to customise them to your needs but there are plenty on IFTTT to get you started and provide inspiration. Philips Hue aside, the insight into the possibilities of the “Internet of things” is incredible. I hope you have enjoyed this short series of articles on Philips Hue. It’s the first time that I’ve done this kind of short serial, so I’d welcome feedback in the comments on whether to actively search out similar opportunities. Thanks again to Philips for the loan of the Hue Personal Wireless Lighting System. Today If this then that (IFTTT) came to the iPhone. 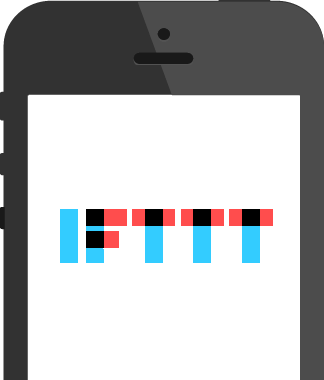 If you are not familiar with IFTTT, it is an automator tool for the Internet. For example I use Feedly and Pocket and I use an IFTTT recipes that sends any article I save on Feedly to Pocket. There are hundreds of recipes that users have created on IFTTT from the very simple to the very complex. If you find yourself doing the same thing over and over again on the Internet that can be described as If A happens then Do B then you need to take a look at IFTTT. Previously IFTTT was only available through the desktop. Today it was released to as an application to iOs, specifically for the iPhone, although it will work fine on the iPad. The app has added Contacts, Photos and Reminders function to IFTTT adding more recipe possibilities. I have already set one up that sends any photo I put in a specific iPhoto album automatically to Flickr. The bad news per Gizmodo is the app has to be active on the iPhone for the recipe to work. Unfortunately Apple doesn’t allow apps to run persistently in the background. This means that if you want to use a recipe you will have to open the IFTTT app first and then proceed. This kind of removes the automatic part of the equation. This problem will not exist on Android which does allow apps to run in the background. Despite this I do think it is worth downloading and giving the IFTTT app a try. I was on Google Plus I believe and someone mentioned a site called ifttt which had just gone into public beta. The idea behind the site is to create simple connections based on if A occurred then B should result. Another words if this then that. For example I created one that says if I post a tweet with a link in it than send that link to Pinboard. Another one I created is at 4 PM I get an SMS reminder that it is time to start dinner. These are just two examples of hundreds of if this then that connections that can be created. Some of the sites and applications that can be used to create connections include Twitter, Facebook, Evernote, Dropbox and email just to name a few. If you create a connection you can either keep it private or make it public and publish it as a recipe. You can also use any public recipe that has already been create. I think the idea behind ifttt is a good and some great public recipes have been created. However when I first viewed the site I wasn’t sure what to do or how to do it. There are no directions or how to videos on the site. There is an introductory video before you join, but if I watched it I don’t remember it. There is also no way to search public recipes by keyword or title. Which means a lot of people are creating the same recipe over and over again. 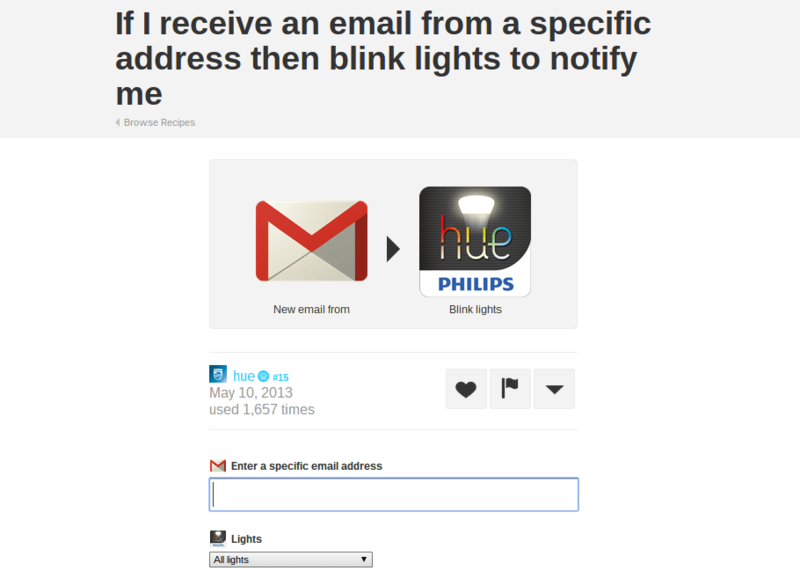 Have you tried ifttt if you have what task have you created. If you haven’t and are interested I have some invites available.